A method that has thrived in molecular evolution may prove to be less fit than a new approach. The old method, which was established 25 years ago, relies on finding “signatures of selection,” patterns suggesting that a gene chanced so quickly during its evolution that selection is likely to have been the cause. The new approach combines two recently developed technologies: statistical reconstruction of ancient gene sequences and engineering of transgenic animals. The trouble with the old approach is that it yields only circumstantial evidence. While it may find historical correlations between a gene’s rapid evolution and adaptive differences between species, signatures of selection cannot establish causation. Genes can evolve quickly for many reasons, such as chance, fluctuations in population size, or selection for functions unrelated to the environmental conditions to which the organism is thought to have adapted. To directly test the effects of a gene’s evolution on adaptation, scientists based at the University of Chicago elaborated on the technique of ancestral gene reconstruction. Essentially, they combined it with techniques for engineering transgenic animals. The scientists call their combination approach the engineering of “ancestralized” animals. Details appeared January 13 in the journal Nature Ecology & Evolution, in an article entitled, “Experimental test and refutation of a classic case of molecular adaptation in Drosophila melanogaster.” As the title suggests, the scientists tested their new approach on a classic example of adaptation—how fruit flies evolved the ability to survive the high alcohol concentrations found in rotting fruit. They found that the accepted wisdom about the molecular causes of the flies' evolution is simply wrong. The current study builds on work accomplished by Joe Thornton, Ph.D., a professor of ecology and evolution and human genetics at the University of Chicago. He has pioneered methods for reconstructing ancestral genes—statistically determining their sequences from large databases of present-day sequences, then synthesizing them and experimentally studying their molecular properties in the laboratory. Dr. Thornton and Mo Siddiq, a graduate student in Department of Ecology and Evolution at the University of Chicago, reasoned that by combining ancestral gene reconstruction with techniques for engineering transgenic animals, they could study how genetic changes that occurred in the deep past affected whole organisms-their development, physiology, and even their fitness. “This strategy of engineering ancestralized animals could be applied to many evolutionary questions,” Dr. Thornton said. One such question, the source of the fruit fly’s alcohol tolerance, was addressed in the current study in two different ways. Siddiq first inferred the sequences of ancient Adh genes from just before and just after D. melanogaster evolved its ethanol tolerance, some two to four million years ago. He synthesized these genes biochemically, expressed them, and used biochemical methods to measure their ability to break down alcohol in a test tube. The results were surprising: the genetic changes that occurred during the evolution of D. melanogaster had no detectable effect on the protein's function. 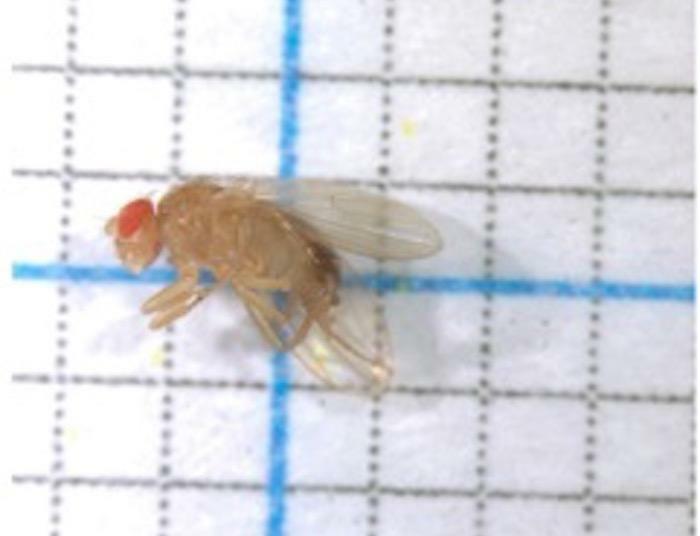 Working with collaborators David Loehlin, Ph.D., at the University of Wisconsin and Kristi Montooth, Ph.D., at the University of Nebraska, Siddiq then created and characterized transgenic flies containing the reconstructed ancestral forms of Adh. They bred thousands of these ancestralized flies, tested how quickly they could break down alcohol, and how well the larvae and adult flies survived when raised on food with high alcohol content. Surprisingly, the transgenic flies carrying the more recent Adh were no better at metabolizing alcohol than flies carrying the more ancient form of Adh. Even more strikingly, they were no better able to grow or survive on increasing alcohol concentrations. Thus, none of the predictions of the classic version of the story were fulfilled. There is no doubt that D. melanogaster did adapt to high-alcohol food sources during its evolution, but not because of changes in the Adh enzyme. Siddiq and Dr. Thornton hope that the strategy of making ancestralized transgenics will become the gold standard in the field to decisively determine the historical changes in genes to their changes on organisms' biology and fitness.